Visions East, Inc. provides its customers with customized computer-controlled robotic systems for the preparation, fairing and painting of marine vessel surfaces and marine mold making. The ROI Calculator is an automated Microsoft Excel spreadsheet that was programmed to determine the labor and material costs associated with fairing, priming and painting a given vessel. Additional logistics costs associated with manual methods, I.E., scaffolding and its labor, are not considered which makes the ROI Calculator even more conservative. Manual methods are compared to automated methods and a projected savings is calculated for illustration purposes. 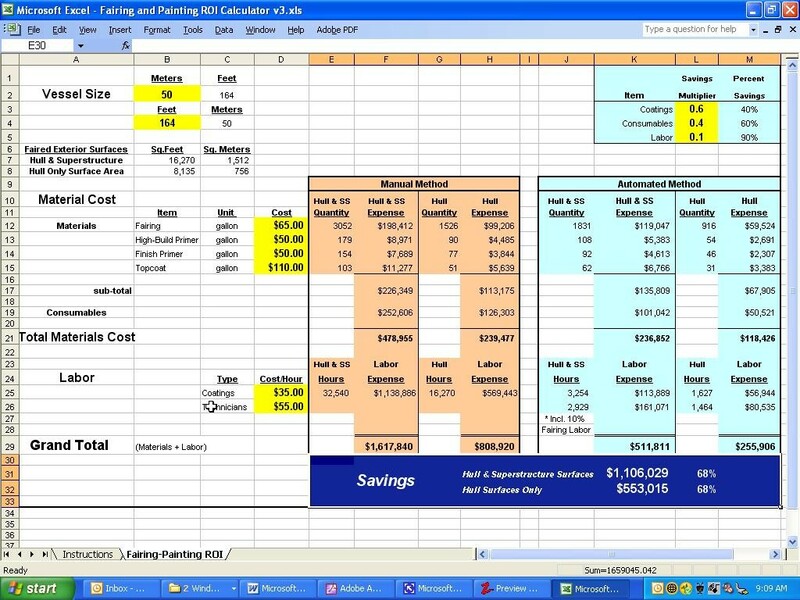 Instructions for its use are on the first page of the spreadsheet and user inputs to the calculator are represented by yellow highlighted cells making it an easy tool to use. The spreadsheet is meant to be an aid in making a system purchase decision and is not a substitute for comprehensive planning for a coatings project. The use of the spreadsheet is offered to customers and prospective system purchasers under the guidelines for copyrighted materials. You must have Microsoft Excel to run the calculator. Copyright © 2003-2007 Visions East, Inc.